Why does someone publish thought-provoking articles on the internet only to cover the excellent content with popup windows (see the screen capture above)? In the early days of online advertising – 15-20 years ago – it was common to bombard web site visitors with popup ads, but it ended when people got fed up with them. Already in 2004, Yahoo and Ebay published a study that indicated that 95% of internet users hated popup windows. Popups prevent users from accessing the content. In the worst scenario, three or more popup windows (also known as modal windows) firmly stand in the way of a visitor who wants to access web page content. Is there an explanation for this? Let’s explore what is happening. Many web surfers are so used to seeing cookie alerts that they simply don’t care about them anymore. If the alert covers only a small section of the screen, most pages can be read just fine. Clicking the close button requires unnecessary extra action that rarely adds any value to the visit. 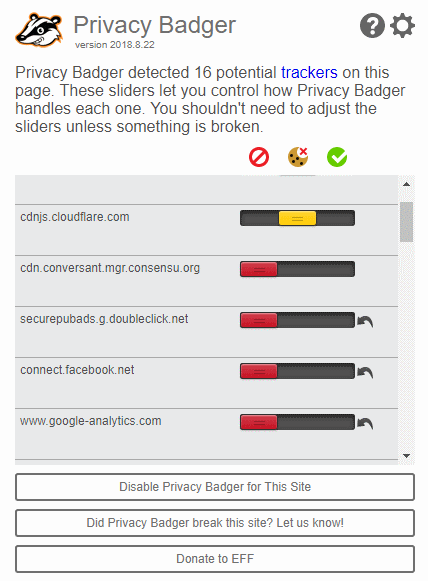 Privacy-aware internet users tend to install ad blockers or privacy management plugins into their web browser apps to avoid tracking and collection of private data. An additional benefit is that web pages load faster and those annoying blinking or animated banner ads are not displayed. Despite all blocker plugins and smart web browser features that should prevent popup windows, the problem with popups is now worse than it has ever been. Let’s take an example. I want to read an article at Fast Company’s web site. It is a magazine that I like and trust. I used to buy it from airport kiosks when I was still reading paper publications, but today, news move fast and they have to be enjoyed fresh. 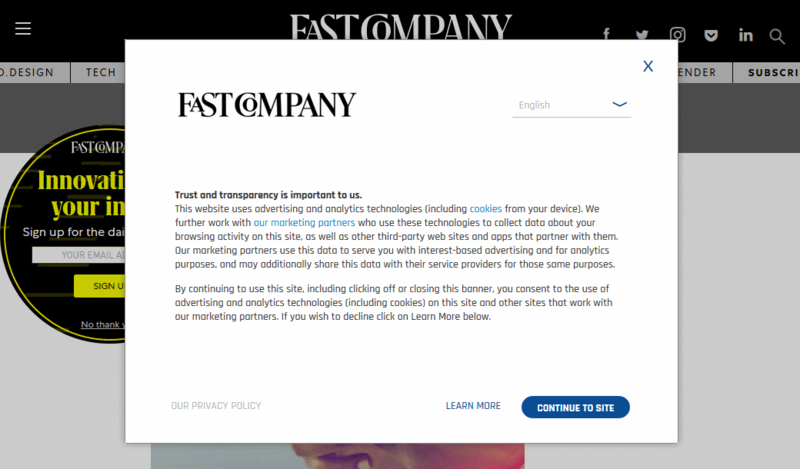 Below is the web page Fast Company displayed to me when I wanted to access an article I had discovered on Twitter. 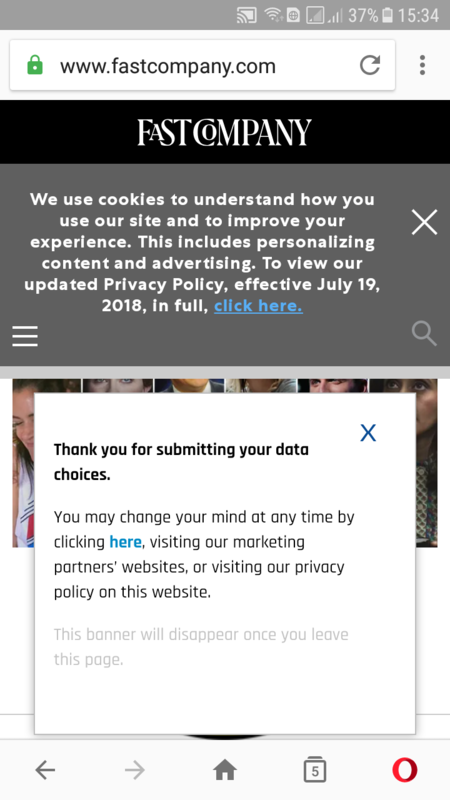 All right, this publication is managing its GDPR responsibilities, asking me to acknowledge that I will be tracked by its business partners, or allowing me to visit the options page to prevent tracking. That’s fine. I tell the magazine and its business partners not to collect my data. Now, I expect that I can read the article. No way, the page is still covered with popup windows. 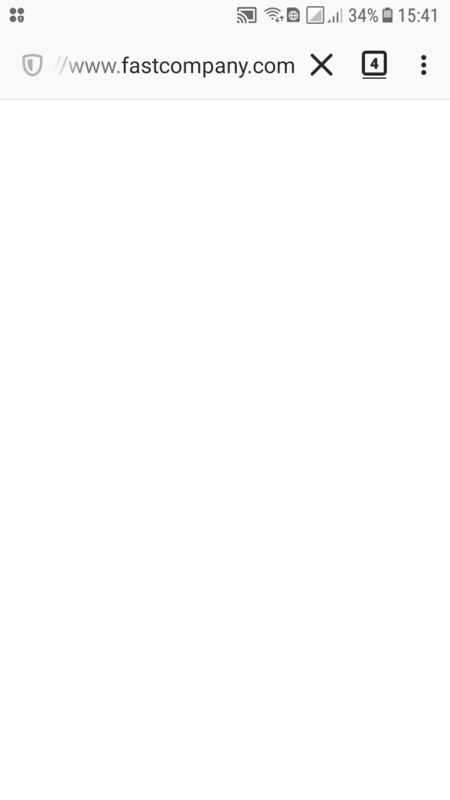 I give up, and leave Fast Company’s web site. I understand if someone isn’t aware that many people have seen the rise and fall of popup windows before. As a reminder for them, a study conducted in 2017 confirms that popup windows (or to be precise, modal windows that cover the content and can’t be bypassed) still are the most hated advertising technique on the internet. 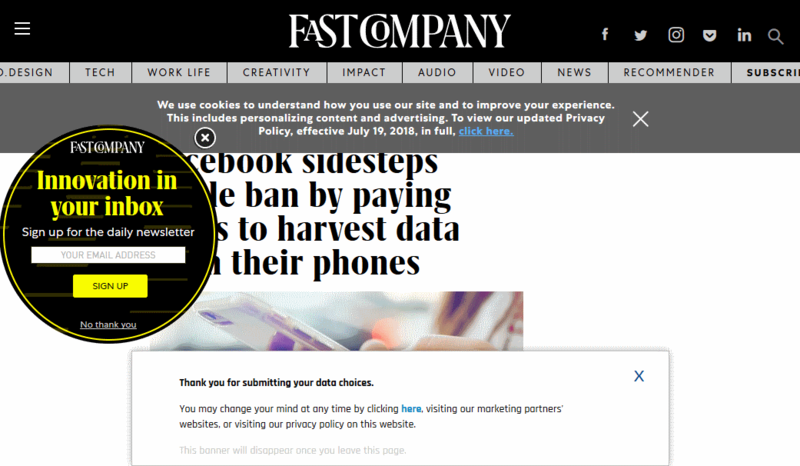 Fast Company has the honor of being the bad example in this story, but there are thousands, or millions of web sites that do the same: follow internet marketers advice to make visitors subscribe to a newsletter, download something, or get something for free. The nasty way of implementing it is to display a modal window that wants input from visitors. 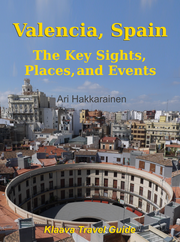 The main price for the web site is usually the visitor’s email address. Sure, web site visitors could pay for the information they access with money. I have tried it. I subscribed to the iPad version of Wired for a couple of years, but reading the same articles on the Wired web page was easier and faster. So, we pay with our data, by clicking (or just watching) ads, and by giving our email addresses to web sites. It’s a deal we have accepted. But if we don’t get anything in return, the deal is off. 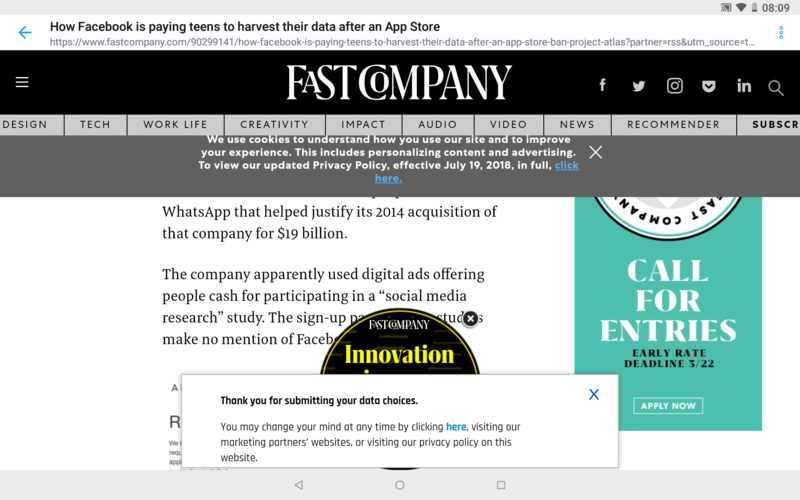 Here is how Fast Company’s articles are displayed on a mobile phone. I tried it in two mobile browsers. The results are shown in screen captures here. I tested the web site on an Android phone (software version 7.1.1), and the browsers that I used for testing are the same ones (Opera and Qwant) I use for all other web sites. What can a web surfer do? 15 years ago, popup ads disappeared because people hated them and voted with their eyeballs. They went to web sites that were accessible. Web pages where the content could be read and viewed. That’s exactly what will happen now as well.